As a bounty Hunter on the outer rim, Greedo has long needed to survive by hisskills and his wits. Though he has a reputation for being slow on the draw,his price is cheap and perhaps best of all, he's expendable. If you want abounty Hunter who can lead a group of hired guns in a desperate attack, youshould certainly consider the Greedo villain pack. 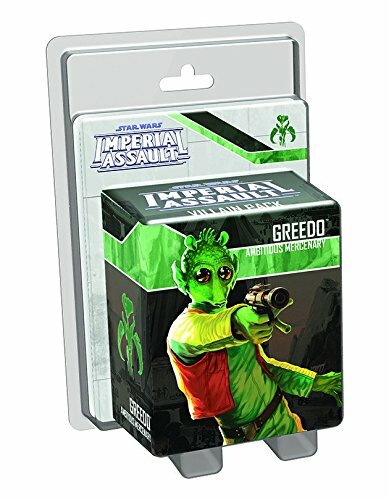 Costing only four points toinclude in your army, Greedo might be just the bounty Hunter you need to fillout your strike team. Two new skirmish missions included in this pack bringyour strike teams into a fortified hangar bay, and a new three-card Agenda setinvites you to hunt down Rebel operatives on ord mantell. With the addition ofnew Deployment cards, item cards, Agenda cards, and command cards, the Greedovillain pack is essential for every mercenary.